When I was eight years old, a small book called Harold and the Purple Crayon changed my life. I was in third grade at the American Community School in Buenos Aires, Argentina. The school had a library that included beautiful leather-bound volumes of the L. Frank Baum Wizard of Oz books and the original Tom Swift adventures from the 1920s. The librarian took an interest in me and recommended books she thought I might enjoy. One day she handed me a copy of Harold and the Purple Crayon by Crockett Johnson. By page two, I felt the world start to shift under my feet. The premise is simple: Harold is a small boy who has a magic crayon that brings anything he draws with it to life. But that was just the start. 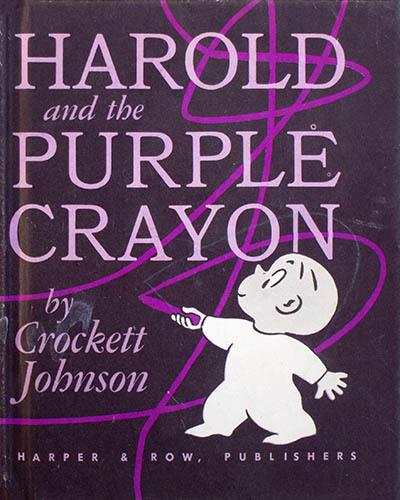 Harold’s crayon didn’t just animate drawn objects — it opened portals to immersive worlds. Better yet, it was wired right into his nervous system. In one scene, Harold draws a monster that scares him, then he stands back in alarm and backs away from it while his hand holding the purple crayon behind him trembles, causing ocean waves to appear on the page. He falls into the ocean, and to save himself from drowning, he sketches a lifeboat above the waves that he climbs into. I never looked at a blank piece of paper the same way again.